Central Asia, with its past of soviet satellite states and frivolous dictatorships, has a wide collection of buildings with incredible architecture. You might not have heard of them before but trust us when we say these are the top 10 coolest buildings in Central Asia! Chorsu Bazaar is the main Bazaar in Tashkent, and is possibly the most exciting bazaar in Central Asia. It’s definitely the most interesting visually though, with its iconic blue domed main building, which is now home to meat, dairy and dried fruit and nuts. Whether you’re a shopper or not, you definitely need to climb to the circular mezzanine on the second storey of the dome to get a view over the unique interior. Come shopping here on our Grand Turkmen and Uzbek tour. Part of our Grand Turkmen tour is one of Ashgabat’s many unique biggest-something-in-the-world buildings – the biggest enclosed ferris wheel in the world. Like all the others, everything is white and gold, and the five carpets of the five tribes of Turkmenistan feature prominently on the wheel-shaped building. For just 3.2 Manat (20-95c depending on the exchange rate you get), you can even ride the wheel, which will almost certainly be switched on especially for you as no one else will be there. There’s also a games arcade, a food court, a billiards room, a space museum, a bowling alley, a 3D cinema and several cafes, none of which of course are ever open. This futuristic glass tent is actually a giant shopping centre, but inside you’ll also find mini golf, an indoor beach, several rides, and of course an entire floor dedicated to being a museum of how Nursultan Nazarbayev came up with the design of the building himself. Our favourite display in the museum is the picture of him looking pensively out of an aeroplane window, and the subsequent scribble on a napkin that vaguely represents the shape of the lop-sided tent. Melons are very popular across Central Asia, but they’re so important in Tajikistan that they even decided to build a giant one just outside the capital of Dushanbe. 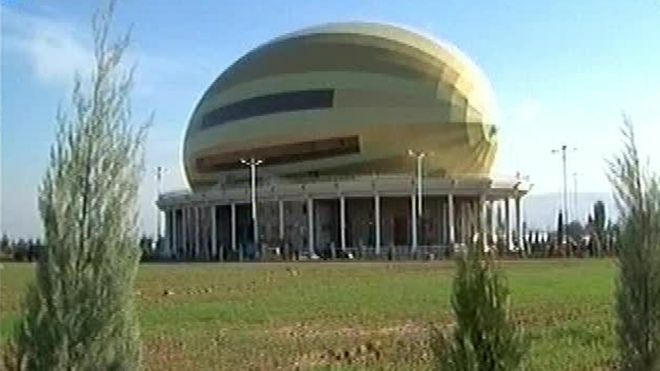 Built as a tea house, the 42 metre tall melon shaped structure is basically a giant function room which is also used for weddings, parties and other events. Nurly Tau is a huge complex of offices, restaurants and entertainment spaces. The jagged, seemingly random shapes of the various buildings, covered from top to bottom in glass, are meant to resemble the Zaily Alatau Mountains which it’s built in the foothills of. 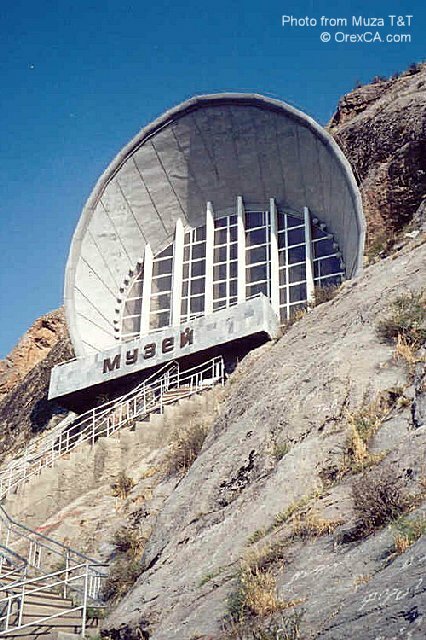 A weird looking circular thing sticking out the side of a rocky hillside, this museum is one of the Soviet Union’s fantastic contributions to Central Asia. Opened in 1949, it was originally built as Osh Regional Museum, however the current building was completed in 1978 and dedicated to celebrating the 3000th birthday of the city of Osh. Pay a visit to the museum during our Kyrgyzstan Independence Day tour. The second largest solar furnace in the world, this feat of Soviet architecture was completed in 1986. Predominantly they did research for aerospace development, though now they mostly just serve as a giant melting oven for private companies. At some point there were plans to make heavy water, but they never quite got there. The most impressive part is one 12 storey building, the front of which is a giant curved mirror. The light reflects off of 63 rotating mirrors on the opposite hillside, and concentrated in the centre, temperatures reach upto 3000 degrees Celsius. The solar furnace isn’t open to the public, but of course YPT has managed to secure access and it’s one of our favourite things on any Uzbekistan tour. See it for yourself on our Uzbekistan Uncut tour. The largest structure in the world in the shape of a horse, this stadium was purpose-built in the centre of the Olympic Complex for the 5th Asian Indoor and Martial Arts Games in September 2017. With a capacity of 45,000, the stadium was used twice – once for the Opening Ceremony of the Games on September 17th 2017, and once for the Closing Ceremony on the 27th. Unfortunately the whole complex is now closed, but the impressive horse’s head is visible from all over the city and part of our Central Asian Summer Combo tour. Probably the most well-known building in Kazakhstan, the 105m tall tower represents an old Kazakh folktale which goes something like this: A magic bird laid its golden egg high up in a poplar tree. Locals were taught to reach for the golden egg, but they never managed to reach it. Like this, you should always reach for your dreams, even if you never dream them. Inspiring, right? Costing over 2 billion USD to construct, the airport was built in the shape of a flying falcon, and with the capacity to process 1600 passengers per hour, or 17 million passengers per year. In a country which approves around 6,000 tourist visas a year. Totally resplendent, but basically empty all the time, the interior of the airport is both impressive and eerie. Fly from this airport on our Turkmenistan & Uzbekistan Summer Combo Tour! If you are an architecture or a photography enthusiast, all of our tours in Central Asia are sure to have something for you! Check them here!